Businesses across Shropshire and Telford & Wrekin are being invited to take up an ‘Active Advent’ challenge to keep their workforce happy and healthy in the countdown to Christmas. County sports partnership Energize has produced a calendar of activities as part of a competition which is now in its third year. 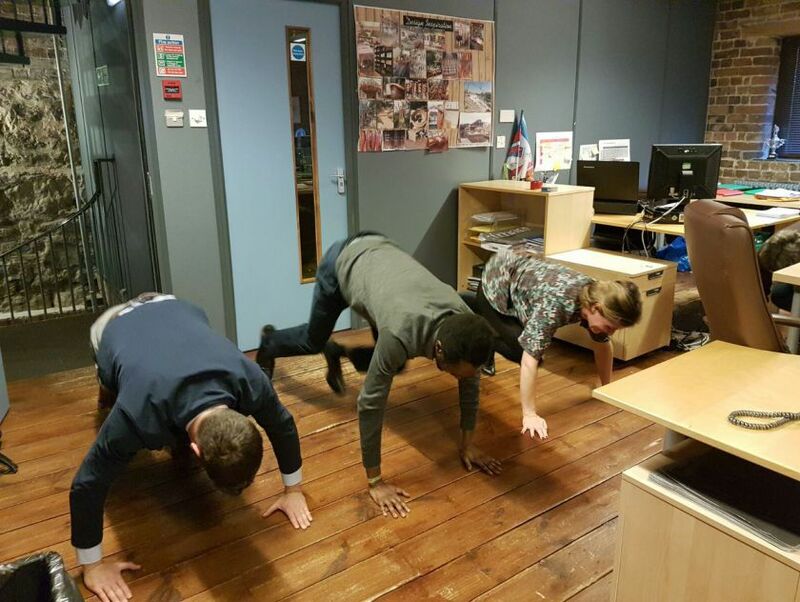 This year’s tasks, which run from Monday to Friday until Christmas Day, include everything from desk chair swivels to leg raises, press ups, jogging on the spot, yoga, burpees and planking. This year, teams are also being invited to tackle four extra Energize interactive team-building tasks, using the Mobile Adventures app. Businesses have to download the app, and scan the QR code on the Active Advent calendar to reveal the challenges. Every team that completes them will be entered into a prize draw for a free Energize team-building event. Harry Robinson, from the Energize team, gave out copies of the calendar to businesses at Shropshire Chamber of Commerce’s Shrewsbury network club. Ben Harper, senior sports manager at Energize, said: “Statistics show that the average worker has 6.6 days off sick every year, costing organisations hundreds of pounds in lost productivity. “By supporting the health and wellbeing of employees, staff perform better at work, are more motivated, have increased job satisfaction and are less likely to look for other jobs. The run-up to Christmas is traditionally one of the least healthy times of the year. Professor John Buckley, at University Centre Shrewsbury, is a leading academic in exercise, sedentary behaviour and cardiovascular health, and has revealed some powerful statistics highlighting how inactivity at work was increasing the risk of serious illness. “Inactivity is now the most prevalent risk of heart disease, above other factors such as high blood pressure, diabetes, smoking, obesity, and high cholesterol,” he said. He told how, even back in 1890, Shropshire’s Olympic pioneer Dr William Penny Brookes was writing about the importance of workers allocating at least half an hour a day to ‘bodily training’. Energize will be offering prizes for companies taking part in this year’s Active Advent challenge, and giving a daily demonstration of each day’s suggested activity on its twitter feed. Ironbridge-based business consultancy Pleydell Smithyman was crowned Shropshire’s Active Advent champion last year – and says it is keen to defend its title in 2018. To find out more, and register for the challenge, follow Energize on twitter @EnergizeSTW, and use the hashtag #activeadvent.